Email me for anything you’d like, and I’ll ship it to you (or email a PDF) with an invoice. Prices are below. 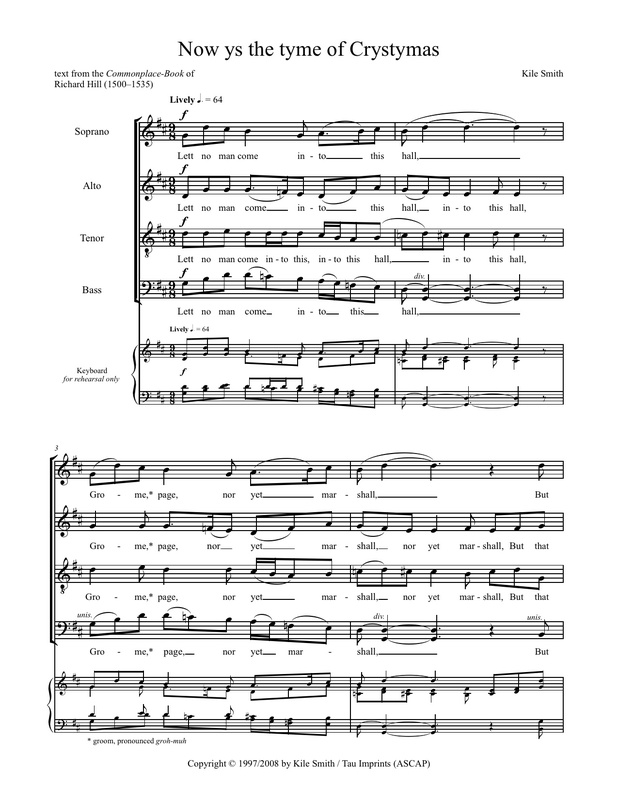 Anthems are octavo or 8-1/2 x 11 size. Sample score and audio ﬁles are below, but email me if something you’d like to see isn’t up here yet (In preparation anthems are listed below the other choral music). Thank you! Available from MusicSpoke! 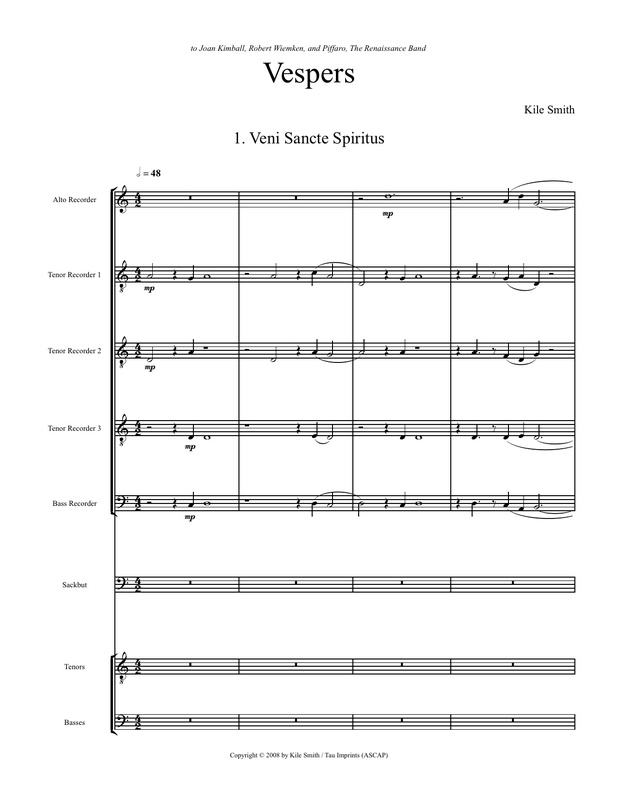 SATB, 5′ (Shakespeare). For the choir of The Church of the Holy Trinity, Rittenhouse Square, Philadelphia, commissioned by Dr. John French, Organist/Choirmaster, to honor The Reverend Alan Neale for ten years of service as Rector. Premiered 15 June 2014. And this, our life, exempt from public haunt, finds tongues in trees, books in running brooks, sermons in stones, and good in every thing. Commissioned by the Cathedral Church of St. Paul, Boston, Ed Broms, Director of Music, for its 100th anniversary as the cathedral of the Episcopal Diocese of Massachusetts, October 7th, 2012, and the dedication of its new sculpture, Nautilus. This is the ship of pearl, which, poets feign, Sails the unshadowed main,— The venturous bark that flings On the sweet summer wind its purpled wings In gulfs enchanted, where the Siren sings, And coral reefs lie bare, Where the cold sea-maids rise to sun their streaming hair. Its webs of living gauze no more unfurl; Wrecked is the ship of pearl! And every chambered cell, Where its dim dreaming life was wont to dwell, As the frail tenant shaped his growing shell, Before thee lies revealed,— Its irised ceiling rent, its sunless crypt unsealed! Year after year beheld the silent toil That spread his lustrous coil; Still, as the spiral grew, He left the past year’s dwelling for the new, Stole with soft step its shining archway through, Built up its idle door, Stretched in his last-found home, and knew the old no more. Thanks for the heavenly message brought by thee, Child of the wandering sea, Cast from her lap, forlorn! From thy dead lips a clearer note is born Than ever Triton blew from wreathèd horn! While on mine ear it rings, Through the deep caves of thought I hear a voice that sings:— Build thee more stately mansions, O my soul, As the swift seasons roll! Leave thy low-vaulted past! Let each new temple, nobler than the last, Shut thee from heaven with a dome more vast, Till thou at length art free, Leaving thine outgrown shell by life’s unresting sea! Available from MusicSpoke! SATB, crotales, bass drum played by singers. 35′ (Boethius, the crew of Apollo 8). Individual movements available. 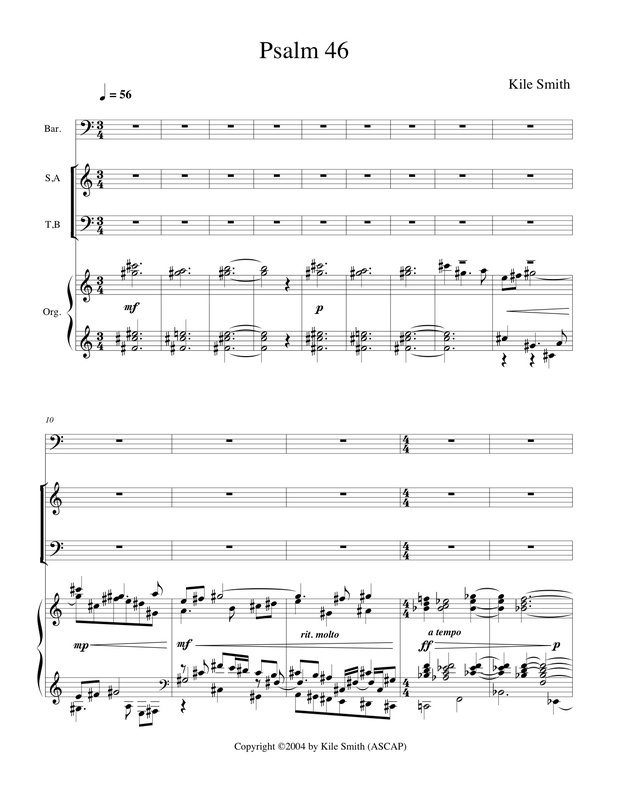 Complete score, audio, text, and notes here. Commissioned by Eric Owens for The Crossing. Available from MusicSpoke! 2-part Children’s Choir, Piano, opt. C Instrument, 9′ (John Archambault). Commissioned by Settlement Music School, Philadelphia, in honor of the 10th Anniversary of the Gleeksman-Kohn Children’s Choir, Rae Ann Anderson, director. First page. SATB, SAB soloists, audience, piano. 4-1/2′ (Psalm 19:1–4, 14). $2.00. Program notes. The heavens declare the glory of God, the skies announce the work of his hands. Day after day they pour out their speech, night after night they tell what they know. There is no speech, there are no words, their voice is not heard. But their line goes out over all the earth; they proclaim to the ends of the world. Lett no man come into this hall, Grome, page, nor yet marshall, But that some sport he bryng withall, For now ys the tyme of Crystymas. Yff that he say he can nought syng, Some other sport then lett him bryng, That it may please at this festyng, For now ys the tyme of Crystymas. Yff that he say he can nought do, Then for my love ask him no mo, But to the stokkis then lett him go, For now ys the tyme of Crystymas. Make we mery, both more and lasse, For now ys the tyme of Crystymas. SATB. 6′ (Psalm 130). Commissioned by Bryn Mawr Presbyterian Church, Jeffrey Brillhart, music director, and premiered there 13 Mar 2016. First page. SATB. 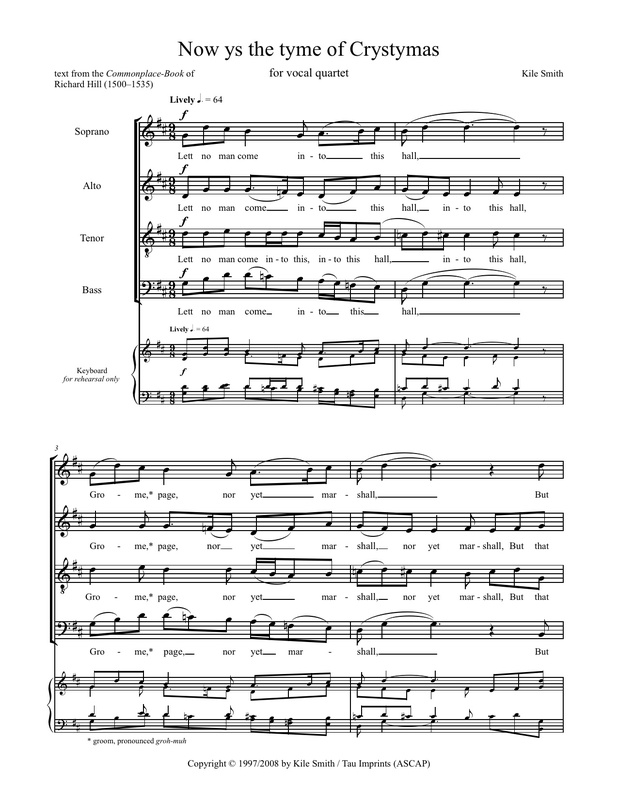 6′ (O Antiphon). 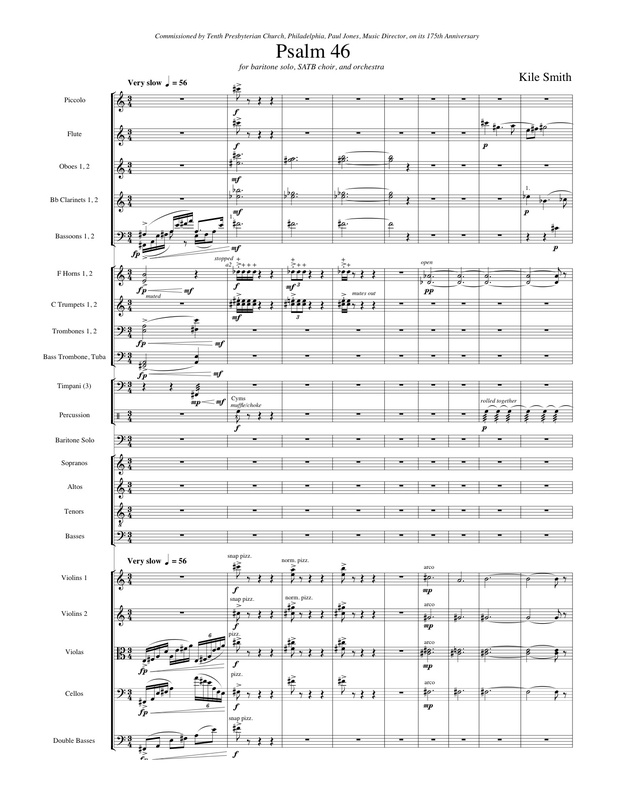 Commissioned by Choral Arts Philadelphia, Matthew Glandorf,artistic director, and premiered 2 Dec 2015, at St. Clement’s Church in Philadelphia as part of their O Antiphons project. First page. SSSATB soloists from within the choir, SSAATTBB choir of at least 16 singers, Renaissance band of seven players. 65′. Program notes. Audio samples. Reviews. Buy the CD. 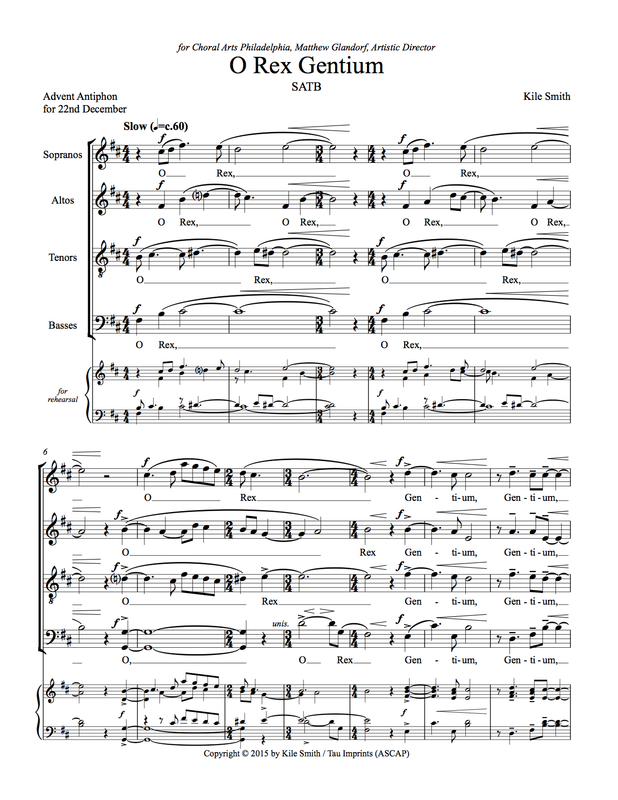 $21.00 full score, $13.00 vocal score, $75.00 parts. The Common Service, published 1917, was issued jointly by the General Synod of the Evangelical Lutheran Church in the United States of America, the Trustees of the General Council of the Evangelical Lutheran Church in North America, and the United Synod of the Evangelical Lutheran Church in the South. 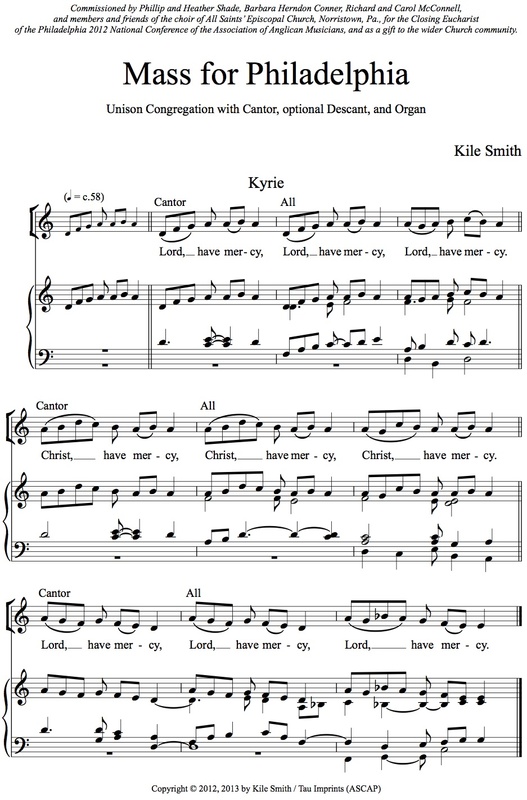 Notation has been revised and some text updated, and all newly re-engraved 2012 and 2014, by Kile Smith and the Rev. Dr. Michael G. Tavella. Available for use by all English-speaking Lutheran churches. Many, many of these; please email me. Kyrie, Gloria, Offertory, Sanctus, Christ Our Passover, Agnus Dei, Nunc Dimittis. 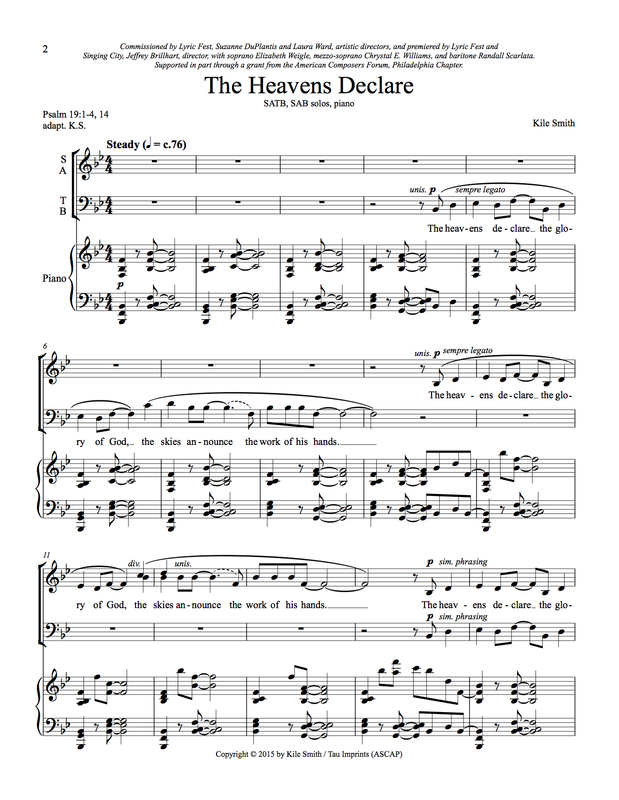 Program notes here, notes on the Offertory, Nunc, and an audio sample here. Review by Liturgy, Hymnal & Pulpit Review. Amazing Grace. opt. 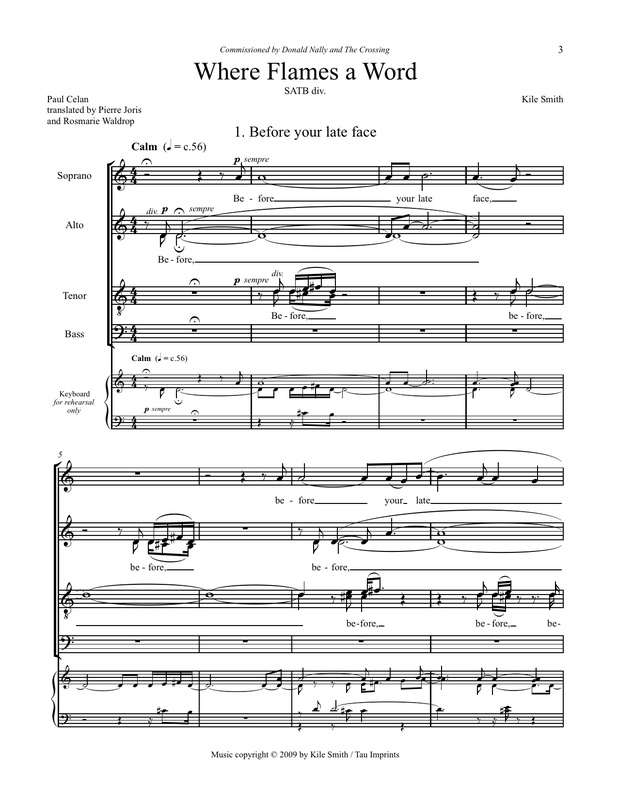 SATB solos, SATB. My God, Accept My Heart This Day. opt solo instrument, SAB solos, SATB, organ.